How can you quickly obtain information that is as comprehensive as possible? The press correspondents of parliament raised that question, and in autumn 1949 they founded the Bundespressekonferenz (BPK; Federal Press Conference) in response. Its aim is to organise press conferences with leading representatives from politics, economics, and culture. The BPK decides who will provide information on which topic. 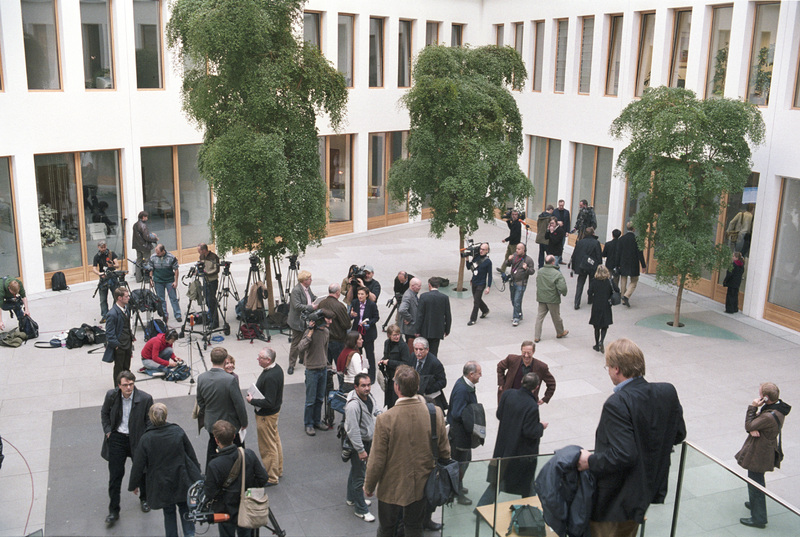 The government press conferences take place according to a fixed schedule. Every Monday, Wednesday, and Friday the government spokesperson and the spokespersons of the ministries are available to answer all questions relating to political events. All of the press conferences are open only to members of the BPK and the Verein der Ausländischen Presse in Deutschland (VAP; association of the foreign press). Guests may be permitted under exceptional circumstances, but they are not allowed to ask questions. The conferences are held in the hall of the Federal Press Conference building. The hall and offices of the BPK are rented from the Allianz Group, which owns the building. The BPK is organised as a registered association. Its headquarters are in Berlin, with a branch in Bonn. The BPK is financed by membership dues. Members must be German citizens and report from Berlin or Bonn on federal politics as their main occupation. Currently more than 900 parliamentary correspondents belong to the BPK. The association's most important committee is the assembly of members. It elects the chair. The members of the chair direct the press conferences. The BPK is also the sole associate of the Bundespresseball GmbH, which organises the annual press ball. It is traditionally opened by the Federal President with a waltz. The receipts from the raffle go to the BPK's social fund. It supports colleagues and their families who are having financial difficulties. Foreign journalists who work in Germany and Germans who have worked abroad agree: there is nothing comparable to the BPK elsewhere. The association is 'unique in the world'.